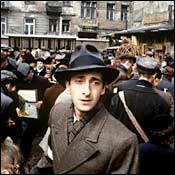 The Pianist is based on the memoirs of Polish musician Wladyslaw Szpilman, who survived the Warsaw ghetto, and it’s Roman Polanski’s strongest and most personally felt movie. This should not come as a great surprise, since as a child Polanski survived the Kraków ghetto and lost family members in the Holocaust. The real surprise is that the horrors on display in The Pianist are presented matter-of-factly – which of course makes them seem even more horrific. We are not accustomed to such reserve in a movie about the Holocaust, and especially not in a Polanski movie, where the violence has often been close to Grand Guignol. But in this film he is trying to be devastatingly true to his emotions, and so there is no need for hyperbole. At times, the tension between the unwavering directness of his technique and the anguish that is behind it is almost unbearable. When we see a Nazi soldier casually shoot a Jewish girl in the head for asking an innocent question, or when we see soldiers throw an old man in a wheelchair over a balcony, we are staring into an everyday inferno. Szpilman, who is played with feral grace by Adrien Brody, survived it: Alone among his family, he managed to escape from the ghetto and hide out in Warsaw until the war’s end. We first see him in 1939, not quite 30, playing Chopin during a radio broadcast interrupted by German bombing. At the end, we see him playing the same nocturne in a concert hall that had once been shelled. It’s as if his story had come full circle, except that he is crying now and savoring each note the way he savored each morsel of food in captivity. Halfway through the movie, there’s a great, brief scene where Szpilman is hidden away in a Warsaw apartment and unable to touch its piano for fear of alerting the neighbors to his presence. The silent agony that ensues is one of the most powerful expressions of spiritual denial I’ve ever seen in a film. Szpilman’s artistry is not sentimentalized; we are never made to feel that he stayed alive because of it. Mostly he survived on luck and gumption. But Polanski recognizes the soul-deep power that music held for Szpilman, and his playing in the end is both an anthem of renewal and a lament. Polanski doesn’t sentimentalize the Jews, either. The Jewish police employed by the Germans in the ghetto are shown to be almost as ruthless as their overseers, and some of the underground operatives turn out to be scoundrels. In his memoir, which was published in 1946 under the title Death of a City and soon banned by the Communists, Szpilman wrote that his experience shattered his belief in the “solidarity of the Jews.” No doubt some people will regard the divulging of that experience as a betrayal, but Polanski honors the Jews of Warsaw by not romanticizing them; besides, there are many acts of extraordinary generosity and courage in The Pianist. They are just as inexplicable as the depravities. Although he engages in some minor arms smuggling, Szpilman himself is not especially brave or virtuous. He is not the kind of conventional hero – or anti-hero, for that matter – a movie such as this would seem to require. He’s a watcher, a reactor, and yet his recessiveness has metaphorical power: Szpilman is like a wraith witnessing the ruin of his beloved city and its people. (The Pianist is, among others things, a eulogy for Warsaw.) When he is finally driven out of his hiding places and wanders the blasted streets, the imagery goes beyond starkness into the surreal – we might be looking at a lunar landscape by De Chirico. The most remarkable aspect of Szpilman’s memoir is that it was written so close to the time of the events described and yet is full of poise and equanimity. There is no ache for revenge in his book, and there is none in Polanski’s film, either. Szpilman lived out his days in Poland as a celebrated pianist and composer of popular songs and children’s music, dying in 2000. Polanski, whose notorious and harrowing life is well known, had not, until this movie, filmed in Poland in 40 years. And yet these two men, who might appear from their lives and works to be temperamentally unalike, share a distaste for special pleading or bathos. In The Pianist, suffering is seen with such clarity that its relief becomes a balm of the greatest magnitude. It’s the relief we get when Szpilman plays the piano again, or merely makes it through another day. In moments like these, we are confronted with the significance, the momentousness, of the ordinary. Much like the Michael Cunningham novel it’s based on, The Hours is tony and allusive. It’s about three women living in different eras during a single day: Virginia Woolf (Nicole Kidman), who is writing Mrs. Dalloway in 1923; Laura Brown (Julianne Moore), a deeply unhappy wife and mother in Los Angeles in 1951 who is engulfed in reading Mrs. Dalloway; and Clarissa Vaughn (Meryl Streep), a contemporary New York personification of Woolf’s Clarissa Dalloway, who is preparing a party for an old love, Richard (Ed Harris), a gay poet in the final stages of aids. At his best, Stephen Daldry, who directed from a script by David Hare, makes the intertwinings among these lives seem mysteriously apt; he gets at the ways in which literature can close us off from the world and yet unify us with others who have read the same books. Cunningham’s novel was an aesthetic conceit, a set of themes and variations on Mrs. Dalloway, and the film puts some flesh on its delicate, brittle bones. (It also adds, unfortunately, Philip Glass’s aural wallpaper.) If all three of the women’s lives had come across with equal weight and artistry, the film, which glides back and forth among them, might have approached the symphonic. But only the Streep section truly inspires the kind of awe and terror that the film as a whole strives for. Streep is having a good run of it this month: First Adaptation, where she seemed newly freed-up and languorous, and now The Hours, where her pinpoint sensitivities are so expressive that you feel as if you’re inside her skin. On the surface, Clarissa has a comfortable life: She’s lived for ten years with the same woman (Allison Janney), has been a book editor with the same publisher for years, and has an agreeably cynical daughter (Claire Danes) who is helping out on the day of the party. Her avid preparations for the celebration are a distraction from the inevitable truth that Richard is dying. Her initial scene with him, where he lashes out at her in his apartment and she vibrates with hurt and rage and sadness, is a master class in how an actress can calibrate a vast complex of emotions and yet seem wholly intuitive. (Ed Harris, alas, is as overwrought as Streep is nuanced.) Streep hasn’t always worked in this way; often her technique honed her responses too finely. What’s changed here is that she’s internalized so much of her character’s ardent spirit that when she lets out her emotions, they are already fully formed. Like the two other women, Clarissa is freighted by the filmmakers with too much victimology – her hurts are displayed as a species of heroism particular to women – but Streep’s vividness avoids easy labeling. Clarissa’s heroism is both mundane and thrilling: She endures because, finally, she loves life for what it is, not for what it can be. Virginia Woolf is the muse of the film, and Nicole Kidman tries hard to invest her with the kind of passion and frailty that would convey both her madness and her fierce sanity. But a prosthetic nose doesn’t help her performance – she looks more like Margaret Hamilton in The Wizard of Oz than like Woolf. (If the filmmakers were so intent on getting an actress to look like Woolf, they should have just hired Shelley Duvall.) The writer’s wounded soul is offered up to us as a kind of talisman, and there’s something too sacrificial, too noble, in such a ploy. When Woolf drowns herself, it is not so much a life that has been taken away as a legend that has been born. Julianne Moore is doing a variation on the same kind of fifties repressiveness that she pulled off in Far From Heaven. (Why do so many filmmakers now have it in for the fifties?) She’s becoming too good at this sort of thing: Her glazed neurasthenia in these films is very Stepford Wives–ish. Her character, Laura, is supposed to be fully alive only when she is reading Mrs. Dalloway. Her inner life is supposed to be her real one; the outer one, which keeps cracking, is just for show. But Laura doesn’t seem to have much going on inside her, either – her zombification is more than skin-deep. The Hours is intended as a testament to the belief that, despite appearances, there are no ordinary lives. The filmmakers want us to know that if we peer deeply enough into the quotidian, we will be exalted by the sheer humanity of what we find. This is certainly true of the scenes with Streep’s Clarissa Vaughn, but as for the other women, what we are left with is a puzzling and forbidding strangeness. In Spike Lee’s 25th Hour, written by David Benioff and based on his novel, Edward Norton plays Monty Brogan, a drug-dealing kingpin who is living out his last full day of freedom before being sent to prison for seven years. Living it along with him are two friends from the old days, a feverish stock trader (Barry Pepper) and a schlumpy English teacher (Philip Seymour Hoffman), as well as Monty’s girlfriend (Rosario Dawson) and his barkeep father (Brian Cox). Monty recognizes the misery his hard-drug dealing has fostered, but mostly he blames himself for being greedy and getting caught and screwing up his life. The filmmakers seem to sympathize with his attitude: They de-emphasize the depredations of dope while sanctifying Monty as a self-sacrificial lamb. How bad could he be? After all, he tends to wounded dogs and is a lot nicer than those burly Russian gangsters he reluctantly does business with. And he got started in the trade as a working-class Irish-American kid from Bay Ridge who was accepted into a private school and sold grass to its well-to-do students. Lee periodically flashes on New York in the throes of 9/11 for that doomy effect, as if the city’s distress and Monty’s were part of the same emotional continuum. This is romanticism of a rather low order. The only time the film really snaps out of its anti-hero-worshipy torpor is when Monty works up an aria of hate toward New York and just about everyone in it, himself included. It’s a multiculti litany that stretches from Pakistani cabdrivers to Hasidic diamond merchants, and even though it doesn’t really have much emotional connection to the Monty we see the rest of the time, at least his outburst has the virtue of being outrageous in the vintage Lee manner. It’s the spritz that refreshes. A lot of people, including me, would like to see the movie musical make a comeback, but the nightmarishly frenetic Moulin Rouge! didn’t do it for me, and neither does Chicago, a reworking by director Rob Marshall and screenwriter Bill Condon of the Kander and Ebb show first staged on Broadway by Bob Fosse. Renée Zellweger is sweet as Prohibition-era starlet Roxie Hart, the chorine turned celebrity murderess who, in this version, fantasizes the big musical numbers; but Catherine Zeta-Jones, as nightclub smash Velma Kelly, and Richard Gere, as slick lawyer Billy Flynn, are wan. The song-and-dance numbers are calisthenic but unspectacular, with too much fast cutting, and the tone throughout is harmlessly facetious. I realize that Fosse’s dark sizzle might seem a bit dated today, but surely something halfway snazzy could have been devised for this movie. It’s toothless. Directed by Roman Polanski; starring Adrien Brody. Directed by Stephen Daldry; starring Meryl Streep, Nicole Kidman, and Julianne Moore. Directed by Spike Lee; starring Edward Norton, Philip Seymour Hoffman.